Whereas many cities hold their gay pride celebrations in June during Pride month, Palm Springs, which endures brutally hot summers, has the good sense to schedule its Greater Palm Springs Pride festival in early November (November 3–5, 2017). Several events also take place on the days leading up to the big weekend, starting with Halloween the week before. Although you may think of Palm Springs mostly as a vacation hot spot for gays and lesbians, this smallish city within an afternoon's drive of Los Angeles, San Diego, Las Vegas, and Phoenix has a substantial year-round and seasonal community of LGBT residents. It's no wonder, then, that the city's gay pride celebration has become one of the community's most popular events through the years, even if it's not quite as well-attended as the two LGBT events for which the region is most famous: the Dinah Shore Weekend/Palm Springs Women's Weekend (March 28–April 2, 2018) and the Palm Springs White Party (April 27–30, 2018), a gay dance and pool party. Beautiful downtown Palm Springs serves as the central spot for the main Pride events. These events are free, pedestrian-friendly, and include music, DJs, dancing, shopping, food vendors, artists, entertainers, beverage gardens, exhibitors, nonprofits, clubs, and more. Pride 5K Run/Walk: Come out Saturday morning for this charity run/walk. The event starts at Palm Canyon Drive at West Chino Drive goes 3.1 miles through the Old Las Palmas neighborhood. Block Party: This takes place Saturday evening along the gay-bar strip on Arenas Road. It includes the Palm Springs Dyke March Rally; DJs; and music by pop, drag, and rock-and-roll artists. Ages 21 and older. Pride Parade: Don't party too late on Saturday night; otherwise, you'll miss Pride weekend's main event—the Pride Parade on Sunday morning. It's scheduled for 10 a.m. to noon along Palm Canyon Drive. Each year's parade features a special theme and grand marshals. 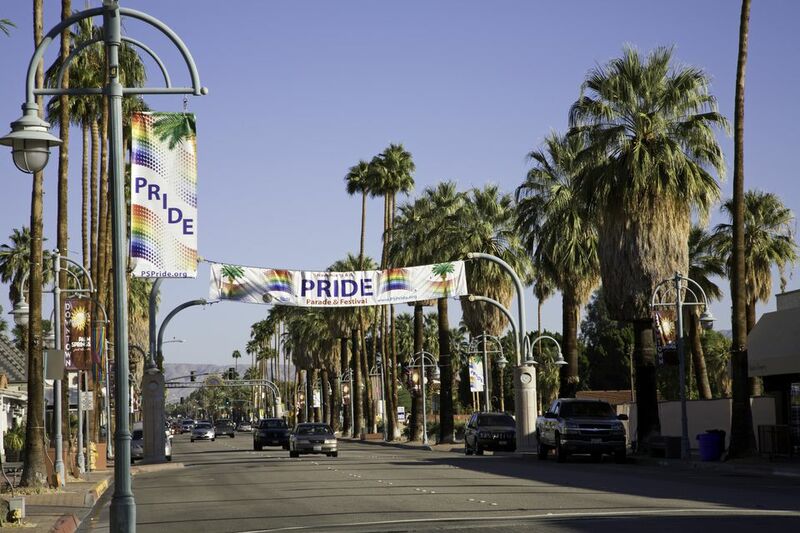 Palm Springs Pride Festival: There's also the weekend-long Palm Springs Pride Festival located in the heart of downtown Palm Springs. The festival features multiple stages for more than 100 performers, plus a children's headquarters featuring games, arts, and crafts. Many big-name entertainers appear at Pride activities each year. Past performers have included the English Beat, Jinx Titanic and the Ladykillers, and Book of Love. These businesses feature special pricing for Pride attendees: Alaska Airlines, Hard Rock Hotel, Saguaro, Ace Hotel & Swim Club, and Hyatt Palm Springs. Before leaving for the colorful Pride weekend in Palm Springs, be sure to pack these desert essentials: water bottle, sunscreen, and hat. Don't forget your rainbow-colored gear. Many of the city's gay bars, gay hotels and resorts, and gay-popular restaurants have special events and parties during Pride weekend. Check local LGBT resources for more information. These include the Gay Desert Guide, the Desert Gay Tourism Guild, the Palm Springs Bureau of Tourism's LGBT web guide, the weekly Desert Daily Guide, and Rage Monthly Magazine.